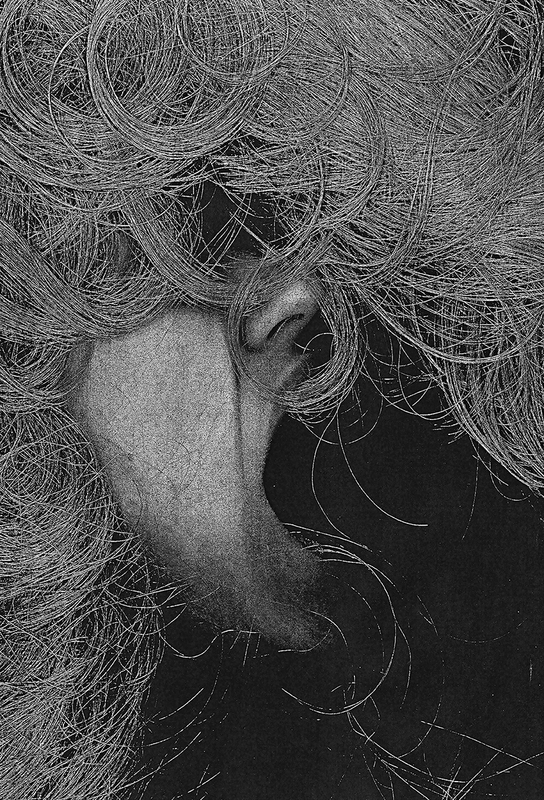 Title: Swallowed (Photocopy/Digital Manipulation-Ikon Copy Machine-Photoshop C.S.6) Location: Syracuse N.Y. DESCRIPTION: I initially asked my girl friend to stick her head into the copy machine at her work while pushing the print button. My girlfriend has the most amazingly luscious hair that I've ever seen. I suspected that if she were to photocopy her hair in black and white that each individual strand would exemplify the aesthetic of the hair strand's individuality. I knew that if the photocopy showed the sharpened edges of each strand of hair that a great depth would also become present in the image. When she came home from work and showed me I was in awe of how amazing the photocopies came out. I then scanned the photocopy into Photoshop and began adjusting the levels, highlights, and contrasts in the image. I believe I created a piece of art that revealed a sense of chaos but also a sense of order. My favorite art often shows both sides of the spectrum in regards to mood. In doing so I believe I achieve a sense of balance. This was one of those pieces that I feel anybody could create if they just had the desire to photocopy their face until achieving the picture they liked. It’s sometimes the simple and colloquial pieces of art that turn out so special. This is a great example of how technology can act as its own artist when used in an unconventional way.